This medicinal agent is designed to cure chronic hepatitis C genotype 1, 4, 5, or 6 in patients with and without cirrhosis. It is very effective in patients undergoing treatment for the first time as well as in those patients who demonstrate no clinical response to the therapy with interferon and ribavirin. 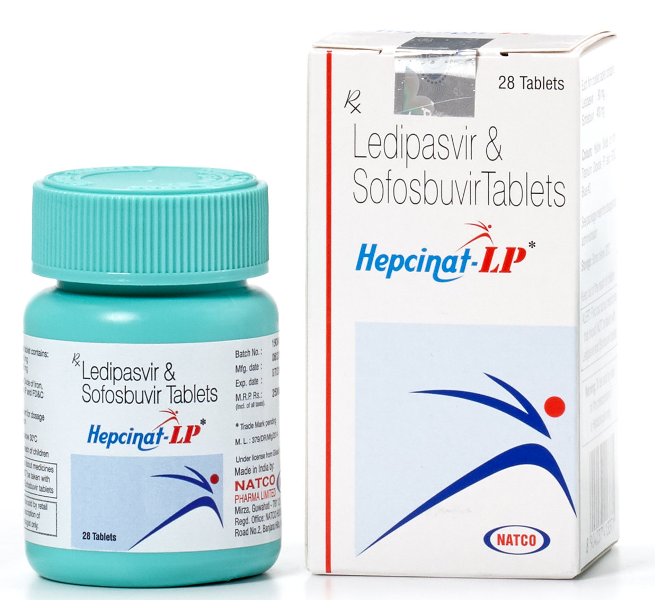 The medication contains two active ingredients: Ledipasvir and Sofosbuvir. These chemical compounds inhibit two different proteins necessary for the reproduction of the hepatitis C virus. Sofosbuvir blocks an enzyme called NS5B RNA-dependent RNA polymerase, while Ledipasvir inhibits a protein called NS5A. By inhibiting these two proteins, the pharmaceutical agent blocks both the replication of the hepatitis C virus and the contamination of new healthy cells. Each pill contains 90 mg of Ledipasvir and 400 mg of Sofosbuvir. have been demonstrated in the recent clinical trials that involved more than 1,500 volunteers. The first clinical trial has been conducted in the volunteers who have never undergone anti-HCV therapy. After 8 weeks, 95% of them demonstrated a sustained virological response, indicating a complete recovery. The second trial has been conducted in patients suffering from cirrhosis. After a 12-week therapy, positive results have been detected in 99% of patients. Today, this medicine is effectively used in the treatment of hepatitis C genotypes 1, 4, 5, or 6. The medicine can be used for 8-12 weeks under proper supervision. Based on the population pharmacodynamic analysis in patients with hepatitis C, it was found that cirrhosis provides no clinically significant effect on the healing action of the drug. The pharmacokinetic properties of the drug have been studied in the group of adult healthy volunteers and in the group of volunteers with chronic hepatitis C. When administered orally, the highest average concentration of the active ingredient has been reached within 4–4.5 hours after taking the drug. Sofosbuvir was rapidly absorbed, and the maximum median plasma concentration has been observed no more than one hour after administration of the medication. Since the therapeutic agent contains two active ingredients, any interaction with these substances alter the general curative effects provided by the combination. The highest documented doses of Ledipasvir and Sofosbuvir are 120 mg twice per day for 10 days, and a single dose of 1200 mg, respectively. In the recently conducted clinical studies with healthy volunteers, unexpected effects were not observed after the administration of the abovementioned doses. The incidence and severity of adverse events have been considered similar to the parameters obtained for the placebo group. The effect of the drug in higher doses is unknown. In compliance with the data provided by the Hepcinat manufacturer, there is no specific antidote that may be used to treat the overdose of the medication. In case of overdose, it is necessary to monitor the patient’s health state and provide necessary supportive measures, including monitoring of vital functions, as well as monitoring the clinical status of the patient. Since Ledipasvir binds to the plasma proteins it cannot be completely removed from the body even by hemodialysis. Nonetheless, hemodialysis makes it possible to remove the main metabolite of Sofosbuvir – GS-331007 – with a reduction coefficient of 53%. This treatment medication is considered one of the most well-tolerated drugs used to cure hepatitis C.
Seldom observed severe allergic reactions. Concomitant administration with Ribavirin increases the number of expected side effects. Nonetheless, the drug is generally well tolerated and provides high chances of complete recovery. In case of administration of the drug in combination with Ribavirin and in the presence of a serious adverse reaction that is potentially related to the prime effect provided by Ribavirin, an appropriate dose adjustment should be implemented until the adverse reaction disappears. If, after the end of the therapy, which takes no less than three months, no sustained virological effect is reported, the therapy should be discontinued. Individuals with an allergic reaction to any of the components of the therapeutic agent. Patients undergoing therapy with another medication containing Sofosbuvir due to the significant risk of overdose. Patients undergoing therapy with Tenofovir and/or Emtricitabine.